We welcome experienced players, but equally welcome are those who want to come and learn. We have a thriving junior section consisting of both children and adults, and when you’re good enough, you can graduate as a fully-fledged member of the senior band. If rhythm is more your thing, we have a thriving corp of drums, of which we are very proud. We are unique in the region for having such a drum section, and they are always an attraction at concerts, carnivals and other events. Living in such a wonderful town enables us to take part in some fantastic local events. 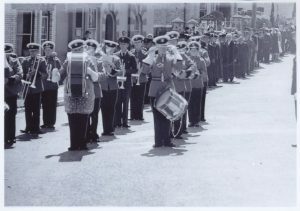 Every year, the band are an important part of the May Fair festivities. The twinning of Torrington with Roscoff, France, has made for some memorable trips to Brittany in the past and every other year we look forward to welcoming our French visitors, entertaining them at various twinning events. We practice and perform at Howe Concert Hall, Castle Street, Torrington, EX38 8EZ. 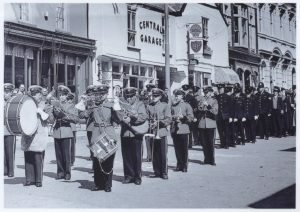 In 1952 members from the Fred Karno’s Band and former members of the Town Band met to form a regular band. 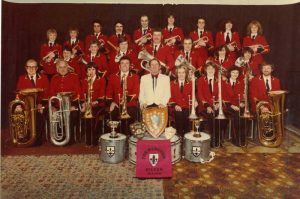 Following this meeting which took place in a cafe in the town the Torrington Voluntary Silver Band was born. Permission was granted to use the instruments that were put into trust since the start of World War 2. They continued to play under the direction of Len Short who trained so many young people to play an instrument. 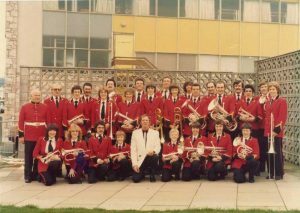 During the many years since formation we have had much success culminationg in playing at the Royal Albert Hall in the National finals. As well as a Senior Band we also have a youth band and our own Corps of Drums. In 2002 the band came together to celebrate our 50 years and we recorded our own CD, ‘ In the Mood ‘ .